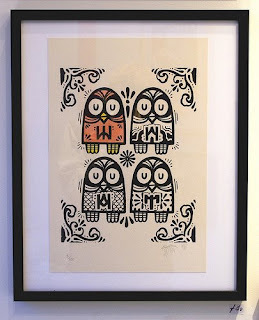 Our Bristol friend 45RPM has just released some limited edition 'Owls' prints. 1 colour hand pulled screen print on 320gsm Malago Arbororeta recycled sustainable acid free archive paper and A3 in size. Each print is hand coloured in either blue, red, brown, yellow, silver or gold. Signed by the artist, embossed and numbered edition of 100. Get yourself a copy over on the Friends & Co. website here..
Also working checking out on the Friends & Co. site are the screenprints from illustrator French and PINKY.